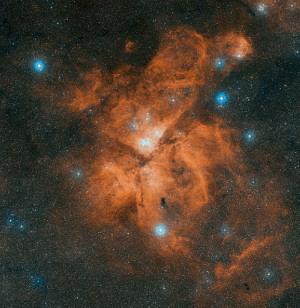 This webpage presents some recent results of our deep multi-wavelength (X-ray / infrared / sub-mm) study of the Great Nebula in Carina. An article in which I described the background of this project is contained in the April 2013 issue of the Star Formation Newsletter. 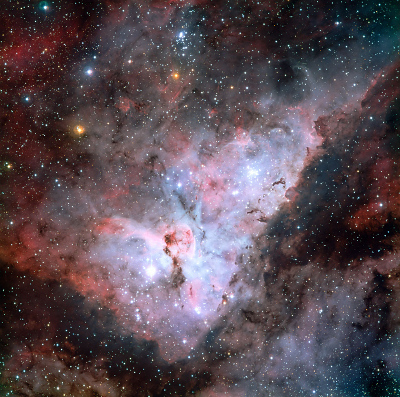 The Carina Nebula contains some of the most massive and luminous stars in our Galaxy and is an ideal site to study in detail the physics of violent massive star formation and the resulting feedback effects, i.e. 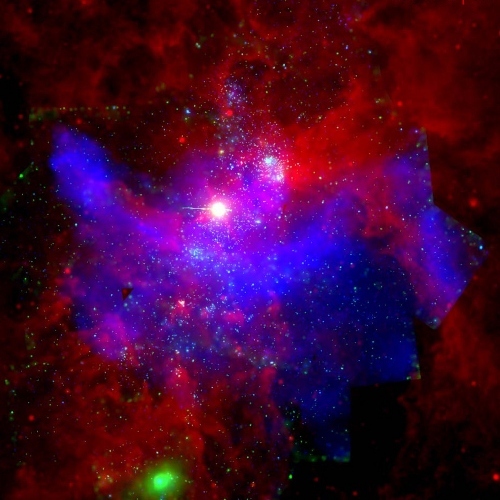 cloud dispersal and triggering of star formation. With a distance of 2.3 kpc, it constitutes our best bridge between nearby regions like Orion and the much more massive, but also more distant extragalactic starburst systems like 30 Doradus. 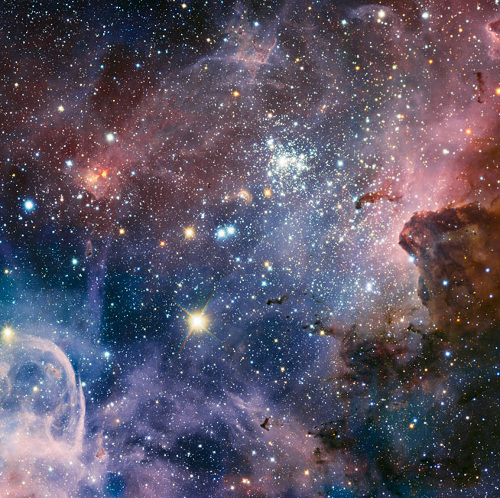 The Young Stars and Star Formation Group at Munich Observatory is performing observations of the Carina Nebula in a wide range of different wavelengths, from X-rays to the radio regime. Our combination of the X-ray data from the Chandra Carina Complex Project with our HAWKI near-infrared images reveal for the first time the full low-mass stellar population in the Carina Nebula and allow us to study the ages, mass function, and disk properties of the young stars. 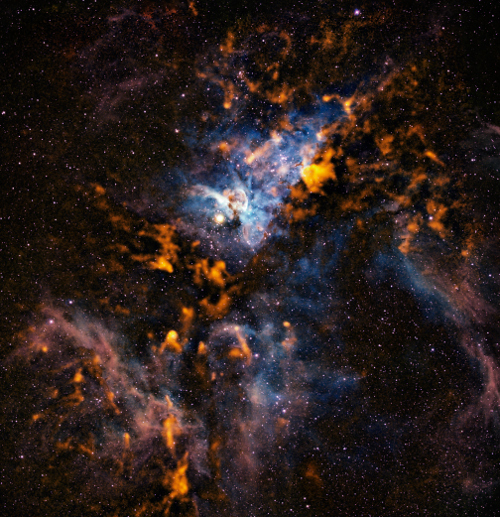 With LABOCA sub-mm observations we also probed the morphology of the cold dusty molecular clouds throughout the complex and studied the interaction between massive stars and clouds. 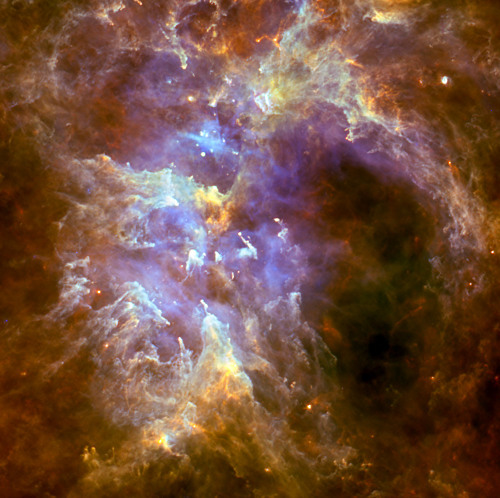 A detailed comparison of these observational data, including our recent spectacular observations of vast pillar-like structures obtained using the MUSE instrument on the ESO Very Large Telescope, to numerical radiation-hydrodynamic simulations of stellar feedback will show how the ionizing radiation and stellar winds disperse the clouds and trigger the formation of a new generation of stars. As examples of the data we are using, we show below some of our X-ray, infrared, and sub-mm images of the Carina Nebula. Further information can be found by clicking on these images. New results will continuously be added as they become available.